I last went to the famous Rose Parade when I was a kid, 1959, to be exact. How is it that I can remember so well? Because that was the last time my Alma Mater, the University of California, Berkeley, played in the Rose Bowl. In fact, I attended a Shogatsu (New Year’s celebration) within earshot of the old Rose Bowl itself. I could hear the cheers from the front lawn of our hosts in Pasadena. We visited all of the floats the night before. 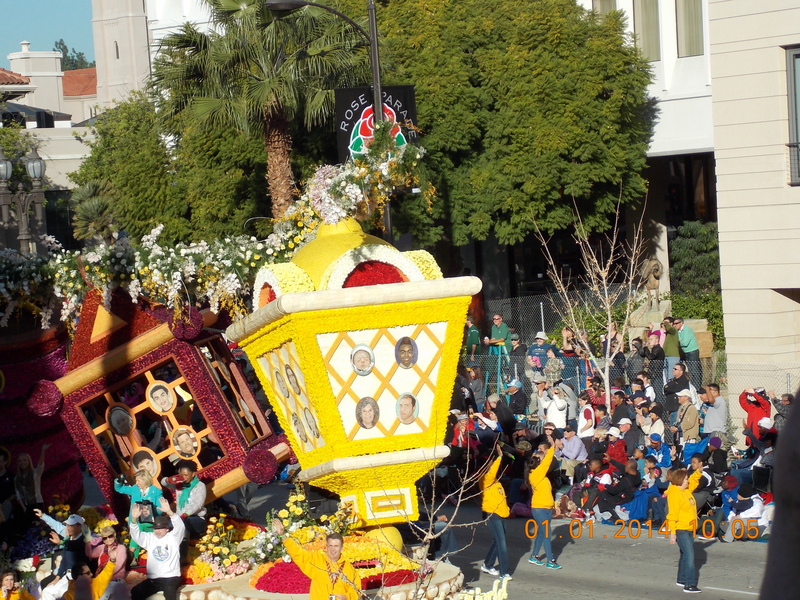 The Rose Parade itself starts at 8am, and lasts only two hours, and heads down the main street of Pasadena, Colorado Boulevard (about 5.5 miles). You might remember the “Little Old Lady from Pasadena” written and sung by Brian Wilson and the Beach Boys. Colorado Boulevard appears in the lyrics several times, as I recall. And yes, Colorado Boulevard is part of Route 66. The Rose Bowl game itself will be number 100 (began in 1902), and the Grand Marshall for the 125th annual parade is famous Dodgers’ announcer, Vin Scully (voice of the Dodgers for 64 years). By the way, one of the funniest things you will ever hear is Giant’s Hall of Fame announcer John Miller, imitating Vin in Japanese!!! The theme for the parade is “Dreams Come True.” Honda has been the parade sponsor since 2011, and also has the parade’s first float. The Rose Parade has followed the same route along Colorado Boulevard for decades. The 2013 parade had 42 floats, 23 marching bands, 21 equestrian units, and a partridge in a pear tree. 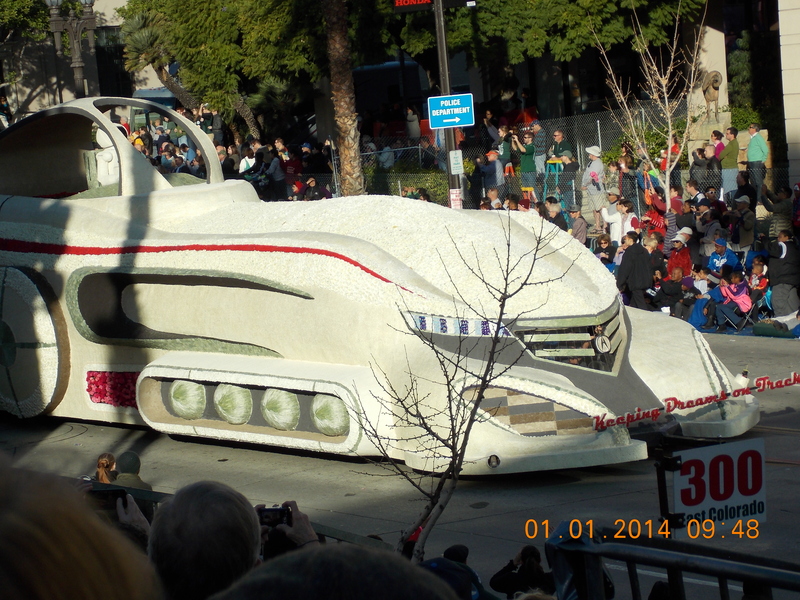 Most floats now are built by professional float building companies. It is a rule that all float surfaces be covered with natural materials, like flowers, plants, seaweed, seeds, bark, vegetables or nuts. No artificial flowers or plant material are allowed, nor can the materials be artificially colored. 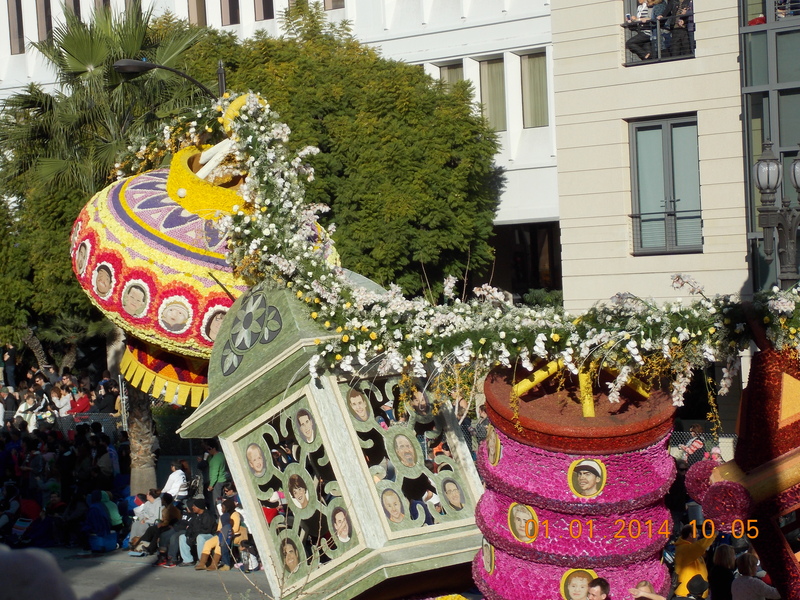 The floats compete for one of 24 awards, given by three judges. The judging takes place the day before the parade itself, when many floats are still in preparation. This year, with the warm weather in the mid to high 70’s, the flowers can wilt quite easily. This forces the float builders to finish much of their float during the last 24 hours or so. After the parade, the floats are kept on display for another day and a half. Horses have played a big part in the parade, with Montie Montana a perennial parade participant until his death in 1988 (60 appearances). Top marching bands from all over the world are also invited. The Tournament of Roses Honor Band consists of the best student musicians from California. University marching bands from the two participating teams in the Rose Bowl are also invited to the parade. In this case, Michigan State, and the rag-tag bunch from a junior university somewhere down the Peninsula. Among the famous Grand Marshalls: Shirley Temple, Bob Hope, John Wayne, Walt Disney, Mary Pickford, Dwight Eisenhower, Jackie Robinson (posthumously), Buzz Aldrin, Mickey Mouse, Amos Alonzo Stagg, Herbert Hoover, Robert Gordon Sproul, Arnold Palmer, Lawrence Welk, Billy Graham, John Wayne, Frank Sinatra, Hank Aaron, Kermit the Frog, Bob Newhart, Chi Chi Rodriquez, Bill Cosby,and Jane Goodall. Projected attendance at the parade is consistently estimated at 700,000 people. Little did I know back in 1959 that I would attend another Rose Parade fifty-five years later. Even worse, I did not know that my Cal Bears would suffer the longest drought in the Pac 12 for a Rose Bowl appearance. Is it that hard to find athletes who can attend the University, or do we just follow the rules a little more closely than the others? It may be one sporting event on my “Water Pail List” that will never be fulfilled. Monday evening, we attending the Donate Life gala dinner in Pasadena. This organization has sponsored a float in the parade for 12 years now. It is comprised of people, friends and family of transplant donors, and recipients. The dinner honored the many who gave organs and tissues, as well as those who received them. The stories are quite compelling, often emotional, and always tearful. Many of the donors are children and babies. Many told their stories during the course of the evening. My friend who invited us, the former Surgeon General, presented half of the floragraphs that will reside on the float (pictured, called, “Light Up the World.”) itself. Floragraphs are a computerized floral display of the recent donor or recipient’s face. It is a great honor for the families of the donor. He lost both his wife, and one of two daughters to separate auto accidents in the Washington, DC area. Both were organ donors. The stories are strong, and poignant, never easy. I can tell you that each of us needs to review our participation as a future donor. It is easy to join the millions of people who have checked that little box on their driver’s license. I strongly urge you to join us in this most life-giving and loving gesture. The life that is lost, continues to live on through others, into future generations. We also met the Rose Queen and her court of Rose Princesses. These young ladies are so well spoken, and have attended over 140 events so far in their 2 month reign of official duties. In fact, all of the speakers on the program were quite articulate in sharing their organ donation and recipient stories. What a great way to prepare for the parade today.